Let us know what you thought of Potatoes in Practice 2013 by filling in our short online survey. It only takes a few minutes and will enable us to improve the event in future. 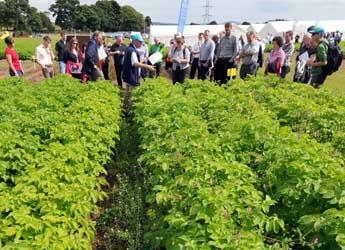 Potatoes in Practice is the largest field potato event in the UK. The event brings together variety trials, research and trade exhibits in one place making it an essential date in the potato industry calendar. Attendees will be able to review crop varieties and see demonstrations, attend a series of seminars on current issues impacting on the farming industry and network with colleagues, suppliers and industry experts. The event is organised by Potato Council, the James Hutton Institute, SRUC (Scotland's Rural College), Agrii and is supported by media partner Potato Review. Attendance at this must-see event is completely free. Online pre-registration has now closed but is not required and visitors can just turn up on the day. Potatoes in Practice runs from 8.30am to 5.30pm. Marquee and static machinery exhibits can be visited at any time. New for 2013! Live machinery demos will take place from 9am to 10am and 4pm to 5pm. Guided tours will run at 10am, 11.30am and 1.30pm. Attendees are free to visit plots for further discussion at any time out with these tour times. The full programme and exhibitor guide is available below and will be handed out on the day. Exhibitor bookings for Potatoes in Practice 2013 are now closed. If you have any queries regarding your booking please email events@hutton.ac.uk. For detailed information for exhibitors, please see below. Potatoes in Practice is held at Balruddery Farm and directions can be found below.